The City of New Orleans must release to The Times-Picayune police department records of 10 officers, including Superintendent Warren Riley, related to any misconduct investigations or complaints, a judge ruled this morning. "They're entitled to these records," Civil District Court Judge Robin Giarrusso said after a hearing in her courtroom. "Public records are public records are public records, and the citizens of this city have a right to know what's in them." Yes, the public needs to know that it can trust the public integrity bureau. Given the NOPD's horrendous relationship with the public at present and by historic reputation, one would think that if the NOPD had nothing to hide, they'd be anxious to open up to the media about how they do business. NOPD advocate groups tried to block another person's request for 16 decades' worth of police complaint records, suing the city and arguing in court Friday that the officers are entitled to a "right to privacy" that goes back to the framing of the U.S. Constitution. Their attorneys suggested at the hearing that they would appeal Giarrusso's ruling to the 4th Circuit Court of Appeal. The newspaper intervened in an effort to allow the city to answer McCarthy's request. Other parties, including the Orleans Parish Public Defenders, were also asking for the NOPD Public Integrity Bureau records. One woman had asked the city for every Public Integrity Bureau file dating to 1992. So it doesn't seem to be Riley's reactionary stance to the "Times Pick-on-you," it's actually long standing NOPD policy. What might it be specifically about the public integrity bureau? In 1954, the New Orleans police department created an "internal affairs" division, Mince said, but in 1995 then-Police Superintendent Richard Pennington abolished it. "He said, 'We're going to have a public integrity bureau," she said. "He recognized the need to restore public trust in the New Orleans Police Department." Riley in 2002 was part of a task force charged by Mayor Marc Morial to review law enforcement's performance, Mince added. The task force members agreed that "an educated and informed citizenry" was key to following the freedoms guaranteed by the U.S. Constitution. But there is A LOT more to it than what was included in yesterday's paper. You have to remember what precipitated Pennington's move, or really what even brought Pennington into town in the first place. A few months ago, I happened to be digging into a little bit of NOPD history and became very much fixated on what was going on in the early '90's. Certainly these are not good times at the NOPD but what was going on before Pennington joined the force was mind-boggling. We're talking about some Wild West bullsh!t going on - from the rank and file all the way up to the top of the force. Former NOPD officer Michael Thames was imprisoned for skimming from illegal gambling, drug, and prostitution rackets to the tune of $100,000 per year. When asked about the Rodney King beating in L.A., Thames responded that he didn't know what the big deal was because that was "kiddie-land" compared to New Orleans. Dr. Frank Minyard, New Orleans coroner (to this day - more on him some other time) defended his office against charges that it fudged an autopsy of Adolph Archie who wounded after killing a cop only to be intercepted by a mob of police officers on the steps of Charity Hospital, taken to a police station, and beaten to death while in custody. Antoine Saacks was a 28 year veteran of the force and the NOPD's second-in-command under Orticke before getting fired a week before 60 Minutes got to town. On a salary of $50,000 per year, Saacks boasted millions of dollars in assets related to number of schemes including a vice-squad extortion racket in the French Quarter, exacting 'fees' for permitting officers to moonlight as private security in the film industry, and by setting up an operation to capitalize on video poker by connecting Vegas firms to a mafia-connected Bourbon St. landlord named Frank Caracci. In 1994, the Clinton Administration granted the Civil Rights division of the Department of Justice new powers to take over troubled local police forces with poor track records on civil liberties, brutality, and racism. Only a handful of police forces were ever taken over but a certain degree of the law's effectiveness is derived from police policy adjustments made under threat of takeover. Given some of the issues illuminated above, certainly the NOPD was an early candidate for receivership takeover. Mayor Morial's decision to search outside the city for a new police chief in '94 resulted partially from this downward pressure out of Washington D.C. Perhaps not-so-coincidentally, the man he picked, Richard Pennington, was plucked from D.C.'s force. After police pay was frozen for some time in 1982, starting salaries for NOPD officers was still so low when Pennington came in that they had to be doubled. Internal affairs was liquidated and the officers were dispersed. Pennington then created the public integrity bureau, moved it outside of precinct HQ and added FBI agents to its staff. Chief Pennington's adjustments weren't a cure all by any stretch, as issues with brutality and corruption continued to plague the force to the point that the Department of Justice opened up an official investigation into New Orleans in 1996 to monitor the reform efforts. The general consensus of the city seems to be that the Pennington era of the NOPD was a success. Significant progressive reforms were instituted that made a pretty noticeable dent in the city's crime stats and in public perception of safety. It is crucial to understand the context behind the decision to scrap internal affairs for the public integrity bureau. Though those changes may have come regardless, the most direct catalyst was the murder of Kim Groves, which occurred just six hours after Pennington was sworn in. Groves was murdered as a result of an execution order from NOPD Officer Len Davis, who was tipped off from within internal affairs after Groves filed a report that she had witnessed Davis senselessly beating a teen aged suspect. 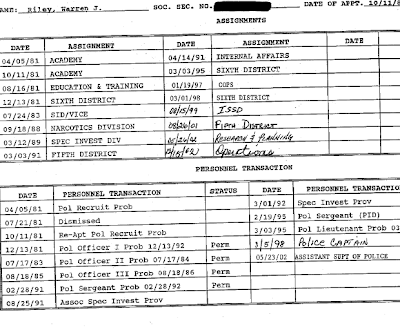 So let's get back to Superintendent Warren Riley's defensive protection of records related to internal affairs and the Public Integrity Bureau. What was Warren Riley doing back in the early '90s? Well, he was at Internal Affairs, assigned there in 1991 after several years between the maligned Narcotics and Vice squads. In late 1997, Riley was suspended for three days without pay after an investigation of an incident that occurred in the months after the Groves killing and two weeks before he had been reassigned out of the new public integrity division that Pennington was creating. Riley was on duty on February 17th, 1995, when Sharon Robinson came forward to report that she feared for her life because she'd just ended things with her then-boyfriend, NOPD Officer Victor Gant who had a long history of physically abusing her and had repeatedly threatened to kill her in the event that she left him. Officer Riley did not file a report or open an investigation. Months later, on April 27th, 1995, after Riley had been transferred to the 6th District, Officer Gant approached Riley to discuss Robinson's coming forward to Riley, for which she had apparently confessed. Gant told Riley that the couple's issues had been resolved. Sharon Robinson's body was found drowned in a swamp days later. The target of the hunt is a serial killer who, investigators believe, has struck at least 24 times. The FBI think that Gant may be the killer but they don't have enough evidence for an arrest. So Gant sits at his desk, suspended from patrol duty. If you have his telephone number, you can call him and hear his Louisiana drawl: "I can't really discuss the case, you'll have to talk with my lawyer." Gant became a suspect after Karen Ivester was found strangled. Her body was dumped in the swamp about half a mile from Interstate 55, just 30 minutes from the French Quarter of New Orleans. As local police combed the scene they found a second corpse, another young woman. Sharon Robinson had been drowned. She was still dressed in her work clothes, a uniform from the Harrah's Casino in New Orleans. Before death, her head had been shaved. In life, Robinson and Ivester had been best friends. Police inquiries at the casino revealed that Robinson had left work on 29 April this year at 3am accompanied by Gant, a 33-year-old officer who was once her boyfriend. The New Orleans Police Department immediately named Gant as a suspect. Then the FBI announced that the man who killed Robinson and Ivester had also claimed 22 other victims. Twenty-one of the killer's victims had ties to prostitution, Ivester included. Nineteen were known prostitutes, including one man. There were two other male victims and there is evidence to suggest they were also prostitutes. According to NOPD sources, each body carried some distinctive marks that matched through all 24 deaths. Gant used to patrol in Treme and Algiers. Several residents say a group of New Orleans police officers has operated a string of prostitutes in the area for years. Some say they've seen brutal beatings and threats of murder and a few have claimed Gant was an associate of one suspect group which allegedly ruled through intimidation. On a recent Friday night the bars along Treme's Claibourne Avenue were busy and outside each one there was a small clutch of women working the street. Many are scared, some are aggressive and few were willing to speak. When they do, they insist on anonymity. "The police and the politicians don't really care about us," said one. "It took over a dozen deaths before those motherfuckers lifted a finger to find the killer. I knew two of the three girls who died but I wouldn't tell the police about it. I'd be the next one dead if I did." The woman then went further. "I saw the girl called Peach just a couple of days before she was murdered. The thing is, some of the cops were running the girls around here, they were pimping. Some people say Peach got out of line." "Peach" was the name used by Karen Ivester. According to FBI investigators, Gant had told some acquaintances that he disliked Karen Ivester because she had persuaded her friend not to join her in prostitution. Local papers report that the Treme prostitutes have been victims of an intimidation campaign by a group of rogue police officers. 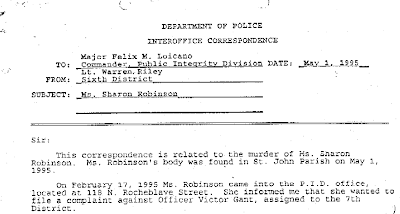 Upon the discovery of Robinson's body, Officer Riley wrote a letter to Major Loicano at the Public Integrity Bureau, telling him of Robinson's visit the previous February. At issue was a request by newspaper reporter Brendan McCarthy to view any Public Integrity Bureau records kept by the New Orleans Police Department on Riley, along with his top three officers and the officers involved in the Jan. 1 fatal shooting of 22-year-old Adolph Grimes. Certainly, we can understand how it is in the interests of Superintendent Riley and PANO (Police Association of New Orleans) to deny public records requests related to Internal Affairs and the Public Integrity Bureau. And we can also understand how it's in Superintendent Riley's interests to deny the public the right to inspect his own complaint records. But I think it will be very interesting to examine common threads possibly bind all ten officers in McCarthy's request together. How many of Riley's top Lieutenants came from the old internal affairs outfit of the early '90s? What about from narcotics and vice of the '80s? The most disturbing thing to think about is how the NOPD in total seems to have gone full circle back to the old pre-Pennington days. How many brutality cases have we heard about since Katrina? How many arrests of uniformed officers? And how much never sees the light of day? by the way, what'd i tell you about state and louisville?!? Warren Riley/Eddie Compass/Ray Nagin have supervised the demise of what was once a model police force and its replacement with it's national-nightmare predecessor. The thing is, the people that should be the most afraid of this is the cops themselves. I'm betting it's 6 months until you get another Antoinette Franks (cop that kills another cop). Add the other commanders like Weathersby and what's his name. They are part of Riley's illustrious past. Just ask around or dig a little deeper, there is a lot of hidden dirt. Also when you talk about Gant, look into Chris Maurice. Why does your blog ignore the story of the burnt corpse and Minyard's complicity in covering up a homicide (a white elected official--who also ruled no homicides at Memorial hospital were most of the 9 victims were black)? Minyard and the white cops are the central part of this story which has been out there since December? So what is the fundamental problem: racist cops who kill with impunity or a black police chief who covers it up? Attacking Riley, who deserves it, will get you kudos from all the racists and I-voted-for-Obama-I-can't-be-Racists, but making the central goal of your investigation a history of white racist cops and demanding that the white community speak out against this wont make you as many friends. Get rid of Riley--which should have happened years ago--and you still have a new phalanx of white suburban and ex-military cops who have taken over the force since Katrina and win continually praise from the "neighborhood activist" community. I think it's safe to say I'll be addressing Minyard and some of your other concerns in a separate post later this week or early next. I mean really... how could I let Minyard off the hook? This is powerhouse stuff man. Well 24 patients died under Dr. Pou's care in a 72 hour period--only nine were brought before the grand jury and without the testimony of the Dr. King who blew the whistle on this case or the testimony of five pathologists who said it was murder. Minyard refuses to release even the race of the victims, but suffice it to say that he ruled all 24 deaths "natural causes" without checking the patient charts or pathology reports on morphine levels. The insurance companies have settled with almost all the victim families on terms that they not comment on the case or settlements--a story the Times-Picayune refuses to do. The legislature capped settlements at $500,000, so there is little incentive for lawyers to take these cases--and you can bet that tenet and lifecare are paying very big settlements to make this disappear--even from the past. Posts like this are why I donated to We Could Be Famous last week. Eli does his homework andf makes those who deserve it infamous. If I had known I would have added a birthday present. there is a grey block over the text about gant and robinson. Riveting. Thank you for doing what you do. great research and critical thinking! Sign me up. My mother was Karen Ivester and to know that her claimed to be killer is still out in this world and hasn't been put away is very uneasy. If the NOPD did have something to do with it or knew something that was never told is even more chilling,, Even though my mother's body was recovered by two fisherman it doesn't give any closure. Which I need along with my older sister. If anyone happens to know more information about my mother's death it would help very much. My email will be added to the bottom of this and would greatly appreciate it..
TeethNightGuard is offering precise fitting and high quality customized dental guards. TeethNightGuard is selling precise fitting and high quality customized dental protectors.